If a land lease expires without being successfully renewed, then the land and everything built upon the land reverts back to the landowner. This means the condo or co-op building and everything else attached to the land belongs to the landowner if a land lease expires, even if the construction of the building was paid for by the tenant. As you would expect, land lease buildings in NYC typically trade at a discount because of the uncertainty associated with lease renewals. This presents a great opportunity for savvy buyers with experienced buyers’ agents if they understand what happens when a land lease expires. If you’re working with a veteran buyer’s broker, he or she will advise you that what happens when a land lease expires depends enormously on who the owner of the land is. For example, most people do not know that all of Battery Park City is on a land lease or that the neighborhood is partially built on new land excavated from landfill material from the construction of the World Trade Center. As a result, the land in Battery Park City is owned and managed by the Battery Park City Authority, a local government agency. Ground leases are the reason Battery Park City apartments have such high monthly charges. The Battery Park City Authority does not need to pay property taxes because of its status as a government agency. In lieu of having to cover the land owner’s property taxes as is common in many ground lease agreements, buildings in Battery Park City are charged “pilot payments” which the Battery Park City Authority uses to build out and improve the neighborhood. Therefore, an experienced buyer’s agent will be able to advise you that you have little to worry about buildings having land leases in Battery Park City. The Battery Park City Authority is a not for profit, government agency whose sole mission is to maintain and improve the neighborhood. There is very little risk that they won’t agree to renew land leases with reasonable terms. Did you know that the Roman Catholic Church is the biggest private landlord in New York City? Not only do they own a lot of land with religious buildings situated, they also lease out a lot of land to NYC condos and co-ops. Because religious institutions are also not for profit organizations, the risk of having a difficult landlord when it comes to renew your ground lease is lower. While the risk is higher than government organizations like the Battery Park Authority whose sole task is to maintain the neighborhood, not for profit organizations like the Catholic Church still present a substantially lower risk profile than private land owners when it comes to what happens when a land lease expires in NYC. Land lease buildings in NYC built on privately owned land can present a major challenge in valuation and marketability, especially if a lease is close to expiring. Land lease buildings in NYC typically have a 99 year lease agreement with two 20 year extension options. Therefore, if you are only 20 years into the lease you might not have much to worry about. However, if you only have 20 years left on the lease you face some serious risks! When inflation was high in the 1970’s and 1980’s, private landlords wanted land leases to step up according to a cost of living or inflation index. Since real assets have rallied significantly when inflation was tamed, ground leases in the last 15 years or so have instead been stepped up according market value of the buildings. The valuation process can be complex and can involve appraisals and counter appraisals by either party. Therefore, a good buyer’s agent will advise you to check the ground lease language regarding step ups in rent to get an idea of how much your future maintenance might be. The ground lease language will also determine which party gets to deduct the property taxes paid. So what happens when a ground lease expires without renewal? This is a nightmare scenario for condo and co-op buildings built on ground that they do not own. The ground lease agreement states that all structures on and capital improvements of the land, including anything added by the tenant, is forfeit upon the expiration of the ground lease. So the building that the co-op corporation paid for and built will simply be handed over the to landlord if a land lease is not successfully renewed. As you can imagine, the co-op or condo board will be in a pretty tough negotiating position when it comes to lease renewal with a private, for profit landlord. 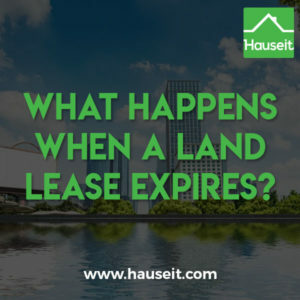 Because of the uncertainty involved with ground lease buildings in NYC, they actually decline in value over time especially as a lease expiration date becomes imminent. Note: A famous example of a ground lease building is the Empire State Building! Why might land lease buildings in NYC be a good purchase? 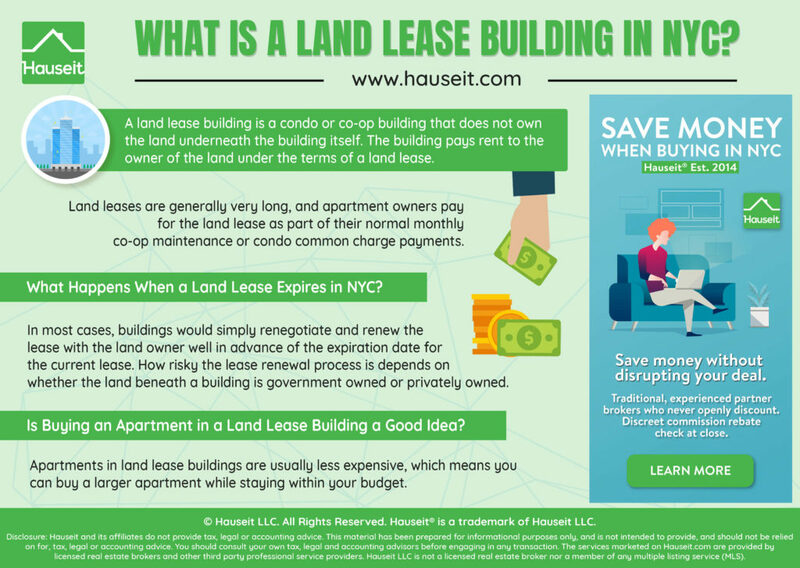 Because land lease buildings in NYC trade at a discount and can be very difficult to value when a ground lease expiration is looming, it might present unique opportunities to a buyer who is more concerned about lifestyle and affordability. For example, a land lease building in NYC might have cheaper 3 bedroom apartments available which would otherwise be out of a buyer’s budget. 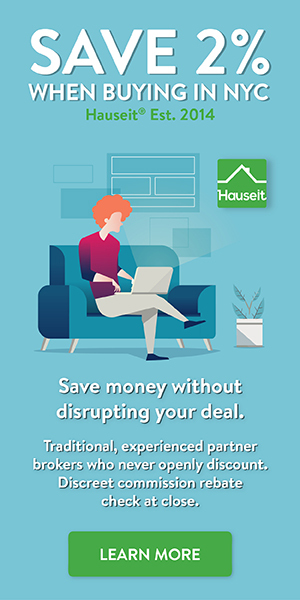 1Lower monthly mortgage payments as a result of a discounted purchase price. Monthly maintenance payments are typically higher for a co-op building with a land lease than a comparable building that owns its land. Pro Tip: Someone once famously said, you should buy or rent, but never do both. Perhaps there’s no need to be so extreme as to avoid land lease buildings altogether, but you should certainly be aware of the ramifications of buying an apartment in a ground lease building. A good real estate attorney will inform you of this material fact during legal and financial due diligence. However, you can find out yourself by looking at the building’s annual financial statements. If the building has title to the land it sits on, you’ll be able to see land as one of its assets in its balance sheet. You will also be able to see lease payments as an expense in its income statement if it has a ground lease. The notes section in the building’s financial statement will also mention the land lease if there is one. The original offering plan will mention the ground lease as a special risk if there is one. Lastly, you may be able to find evidence of the land lease by searching through public records on ACRIS. Note: ACRIS data won’t be available for deals done before 2005 or 2006 which was when the online database was rolled out. You can always check physically with the City Registrar which covers Brooklyn, Manhattan, Bronx and Queens. Staten Island is not in ACRIS at all, you’ll have to check with Richmond County for Staten Island records. Why Do Real Estate Agents Not Give Commission Rebates in NYC?